The proposed $120 million renovation and expansion project of the Mid-Manhattan Library will better meet the daily information needs of 8,000 New Yorkers on-site and thousands more electronically, creating a powerful catalyst for educational opportunity and economic growth. The current Mid-Manhattan Library occupies a prime location on Fifth Avenue and 40th Street in the former Arnold Constable building which is owned by The New York Public Library. The expansion will add an additional eight floors and 117,000 square feet for library service to the existing 139,000 square foot building, while creating a 20,000 square foot ground floor presence for rental to a prominent retailer. The design maintains the existing building, with structural modifications, retaining the contextual/urban reference, while re-imagining the limestone frame as a base and screen for a new, iconic intervention. Using the existing side facades of adjacent taller buildings on both Fifth Avenue and Fortieth Street, the addition acts as a counterpart to the original building; an articulate, glass sheathed, sculptural crystal volume that anchors the corner and establishes an extended and dynamic “place marker” for the New York Public Library/Bryant Park context. 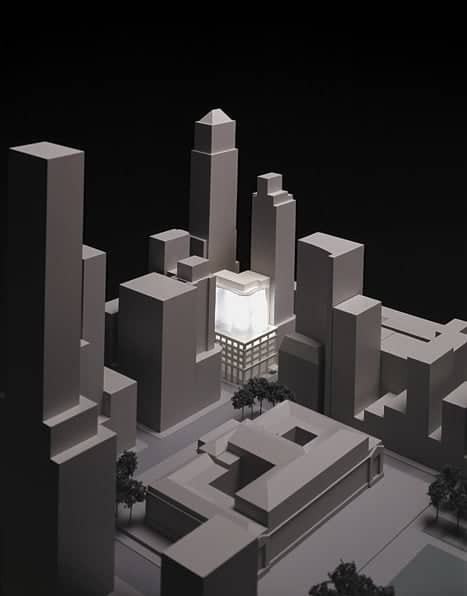 The creation of a singular and memorable new object, as a counterpoint, embodies the visual and psychological presence of the original Beaux Arts Building with a modern vision: “A Beacon of Knowledge”. The expanded Mid-Manhattan library will offer a massive presence of information technology including over 300 computers, 100 laptops, and broad access to hundreds of electronic databases and technology training programs combining computer literacy and library literacy. Facilities will include five “Information Commons”, one on each of five paired floors: Reference, Art, History and Social Sciences, Periodicals, and an extensive popular library including multiple copies of the latest best-sellers, language books and literature in addition to biographies, mysteries, travel books and vacation guides, books on tape, videos, and current multi-media items.